Property Size 820 sq. ft. The Blue Church Lodge is a quaint and cozy bed and breakfast Inn. The Lodge sleeps up to 75 guests. Group and wedding parties are welcome. The lobby area is available for catering private parties. Each unit is individually decorated and uniquely furnished. Fully equipped kitchens, gas & wooden burning fireplaces, indoor & outdoor spas, ski lockers, Cable TV, CD players and a convenient on-site laundry facility. We offer free Wi-Fi, free covered parking, maid service every other day in winter, once in three days during summer months and a huge free continental breakfast (winter only). 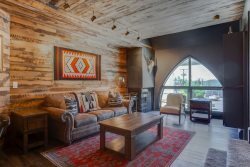 Park City, Utah is host to a plethora of recreational, cultural and night life hot spots and with Salt Lake International Airport only 35 miles from The Blue Church Lodge you could be skiing or snowboarding by the same afternoon as check in. Full amount due for Sundance at time reservation is made. No cancelations or refunds. Call office for early or late check-in or out.